At the presentation yesterday, which was too brief, but had some great nuggets, including a kind of monumentally designed stairwell/ elevator bank for the LIRR railroad station at Wyandanch, New York, remaking the area over as transit oriented, which was actually designed by Jeff Speck, he mentioned that he's also speaking today. The stairwell is a kind of clock tower with no clock or a campanile or a church tower with no bell. 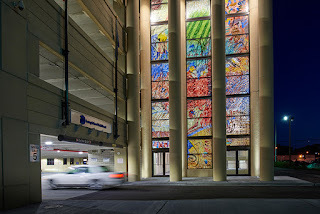 The stained glass windows effect is pretty amazing, even if the pillars fronting the structure are probably a bit overstated. 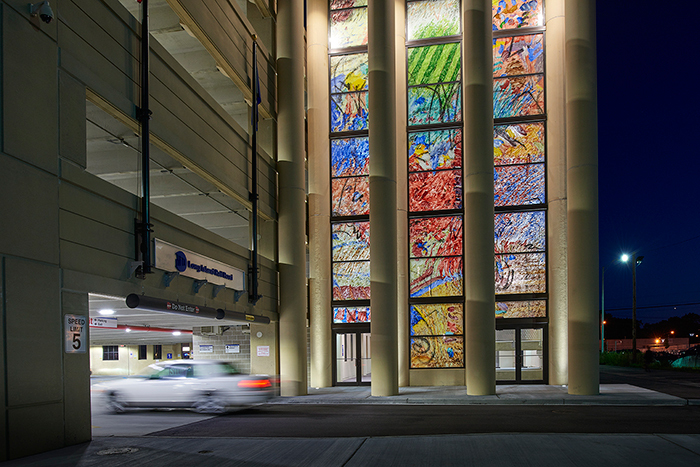 The artistic elements of the parking structure were funded through the MTA Arts & Design initiative, with the work, "Just Jazz" having been created by artist Moe Brooker. I haven't written a review yet. 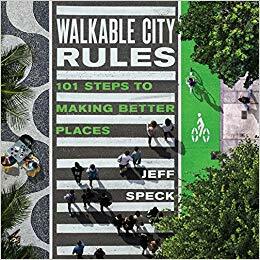 I figure I need to read the first book, Walkable City: How Downtown Can Save America, One Step at a Time, as well. Clearly, other people have thought the same since it's mostly checked out at various DC and Montgomery County library branches. ... off to the Library of Congress.